online by the tools ?tunnel? of dataplicity. 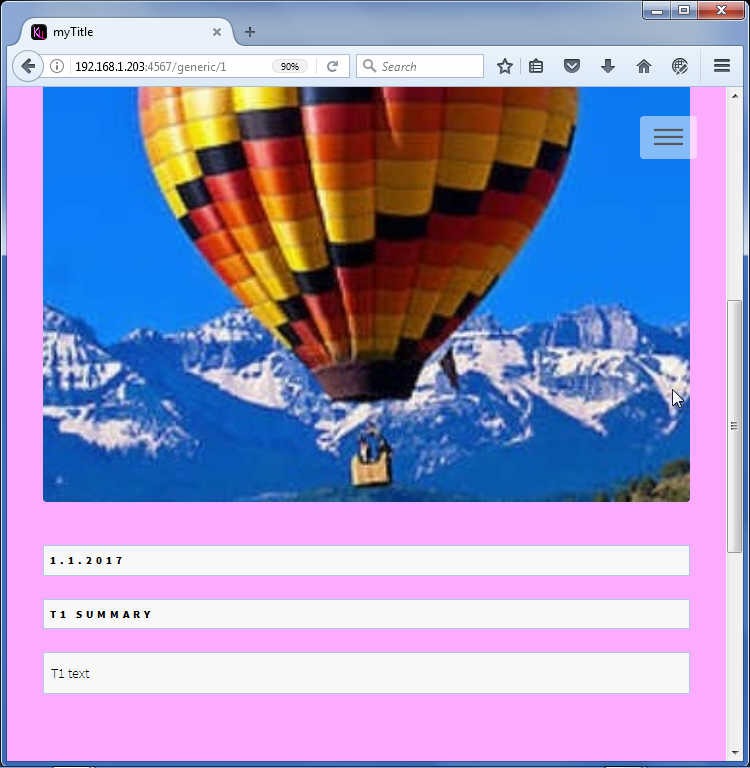 but i had the idea to use instead the flask example mini-blog "flaskr"
well, the HTML template works with all the internal links.., even without server just by opening the index.html in a browser. once you try in flask you have to do it all again! lots of footwork. i found later examples with entry edit delete... what show that that is much more complicated, close to the php / sql work i did years ago. so i found my own way ( using url line ). 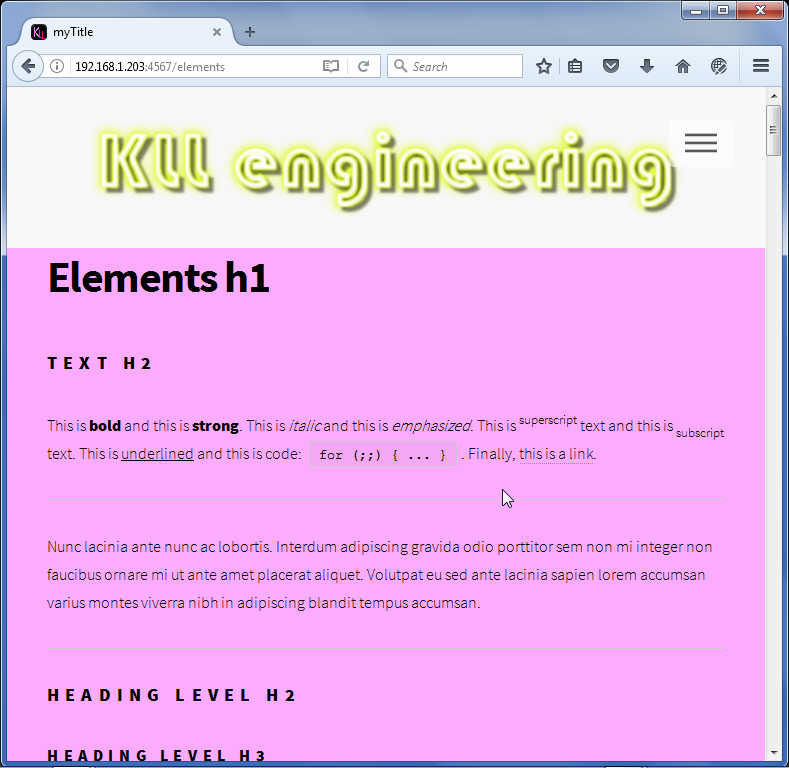 it even has a help page called elements just to show you the CSS-formatting. you can disable it from the menu later. slowly i want to fill it more. 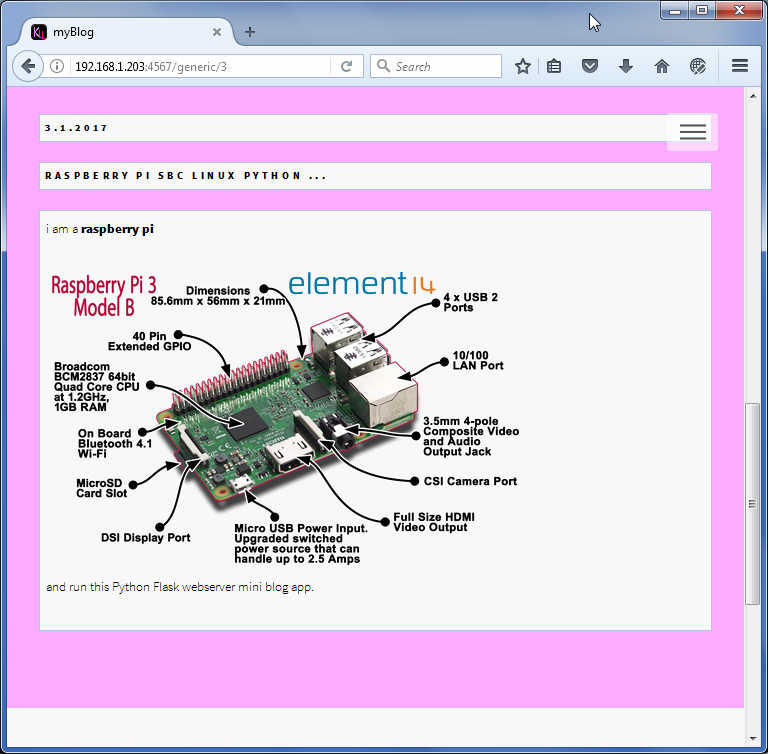 so what i did i used the links from the raspberry pi foundation to show how it is done. and a fix subject so you can identify the email easily . 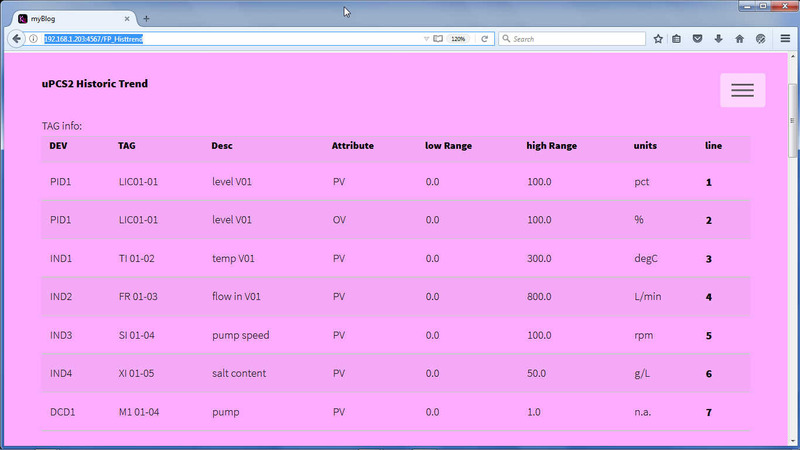 and a SITE SETUP database driven for some SITE variables, incl. user and password where password now is encrypted. 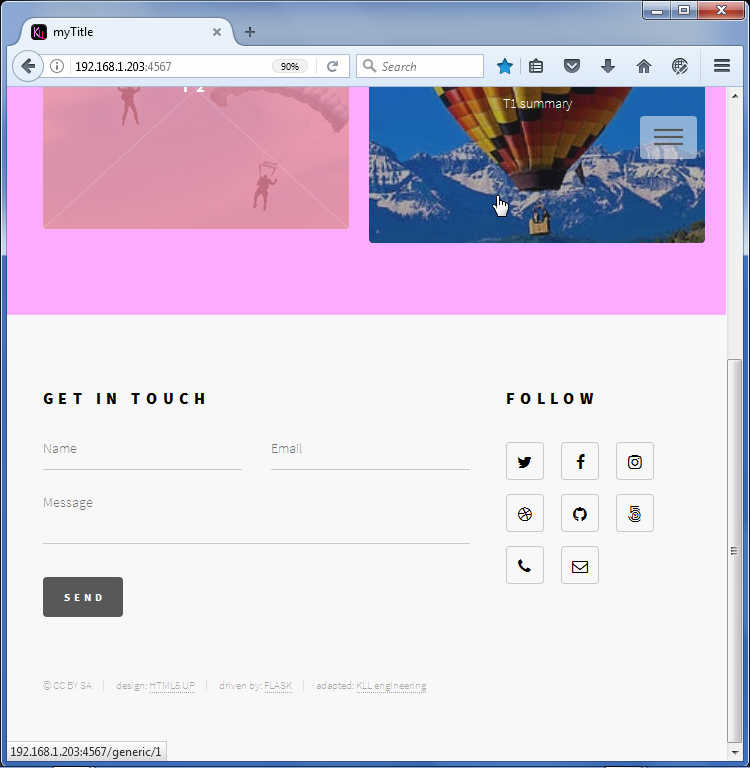 with the |safe switch the (in and ) output of HTML is enabled. but you have to write it in HTML. lists, arrays and especially dict .. between python and flask html i not understand. 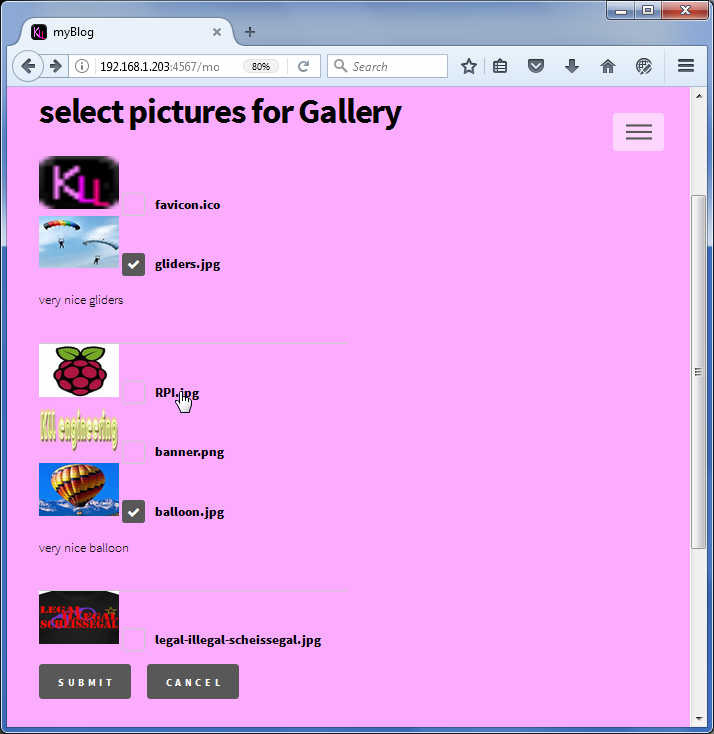 where in a second ( inner ) FOR loop i check if the picture is in the gallery list and get the rem field. sadly HTML not understand this in the checkbox syntax. for functioning they need the path of YOUR installation. replaced the ONLINE tiny MCE by the downloaded, so the pack is much bigger now. and a major play field is the physical computing, combine the uPC with your own hardware / electronics. 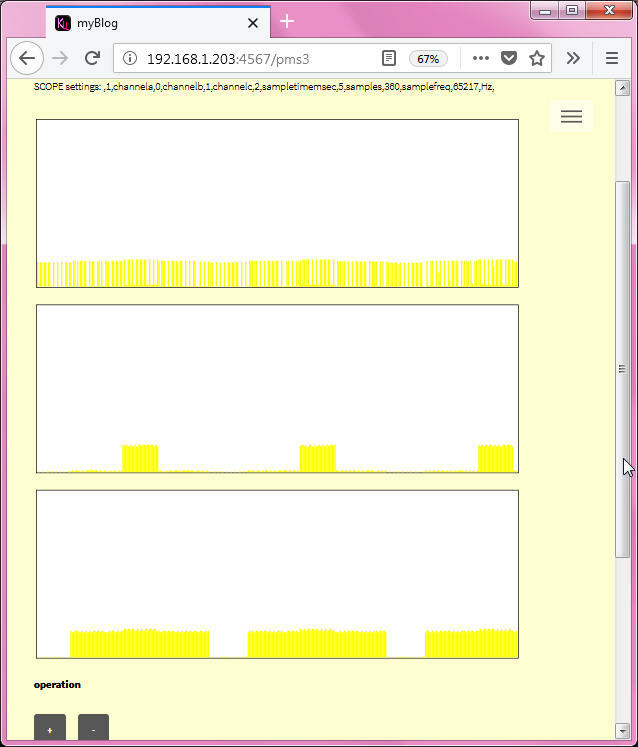 so as we have already a web-server in Python running ( incl. admin structure what can be used for public view of I/O and action ( drive outputs ...) restricted to admin rights. 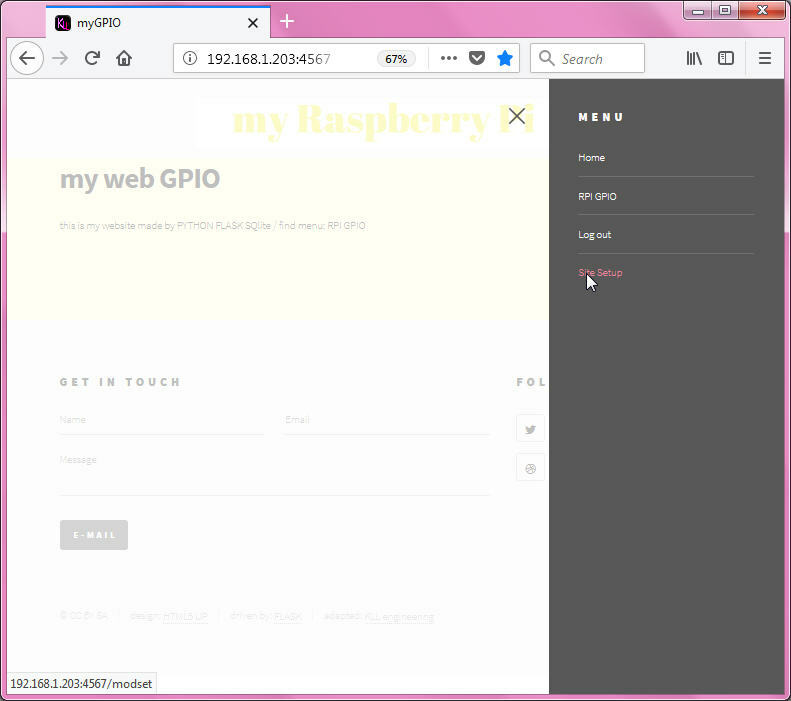 i now want connect the GPIO of the raspberry pi into a web page of this blog. 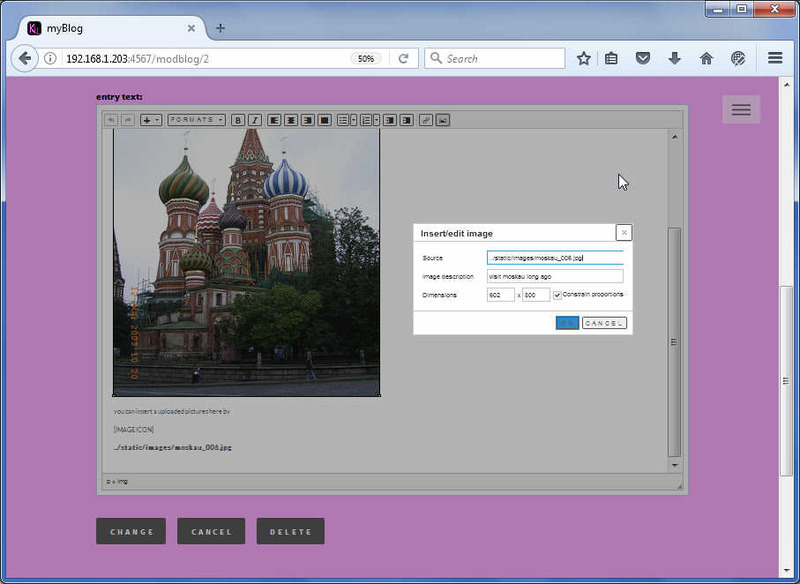 and web page generation is fully automated. 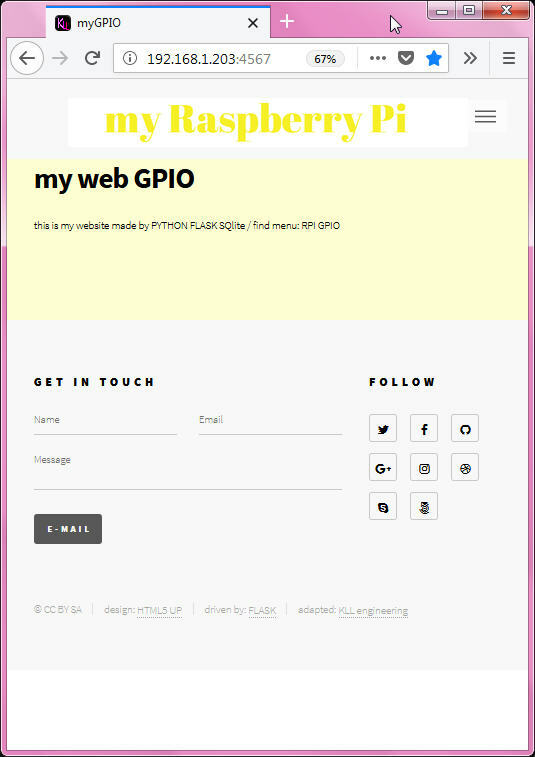 but i not use GPIO so i leave that to YOU. 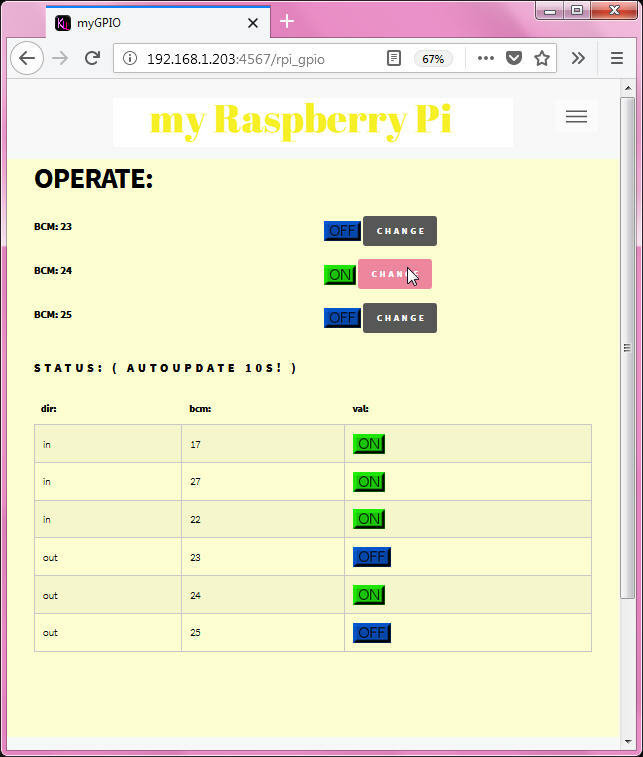 so i use a arduino with USB cable to RPI and all is setup. besides that JUST NOW ( 10.3.2017 ) there ( the nightly) has a BUG what not give you menu and desktop icon see here. one of the first big differences ( to GPIO lib ) seems to be that there is no OUTPUT READ BACK by firmata?? so i make a set / reset instead of a toggle code. 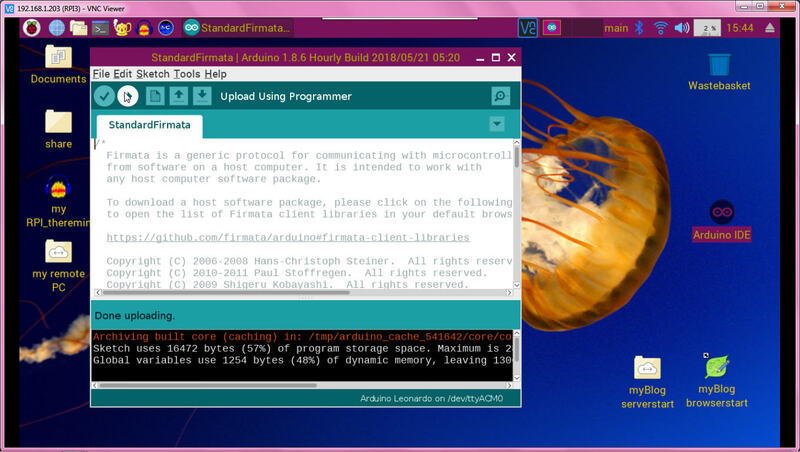 i now setup firmata with channel setup and start iterator and enable reporting ( for the analog channels only) at first start of the arduino HTML page. currently not disable reporting so it will fail from USB side?? still need to update the page to get the first readings. 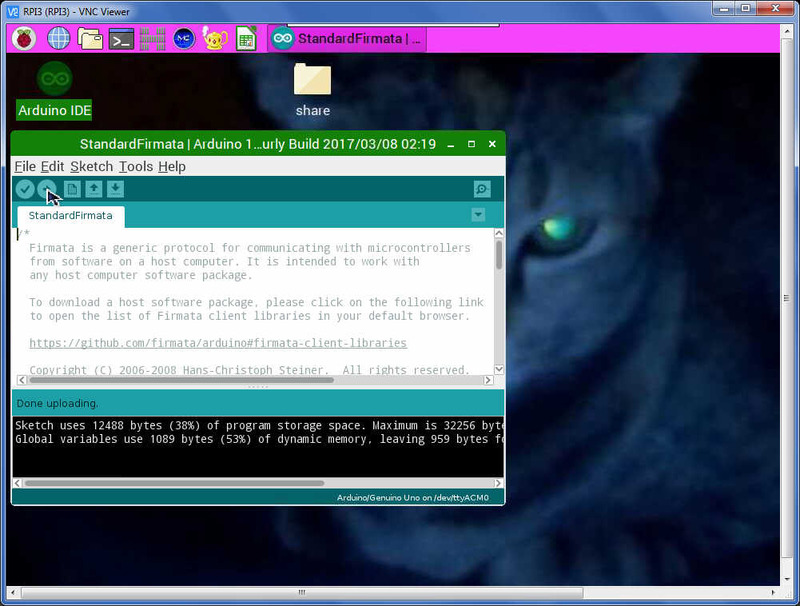 but if i restart the server, output works, inputs not get!, and python flask HTML call not know about this, and the ram disk file still exists like at every succeeding call, means i not do a init, the arduino firmata status ( change by server restart ) is not clear for me. 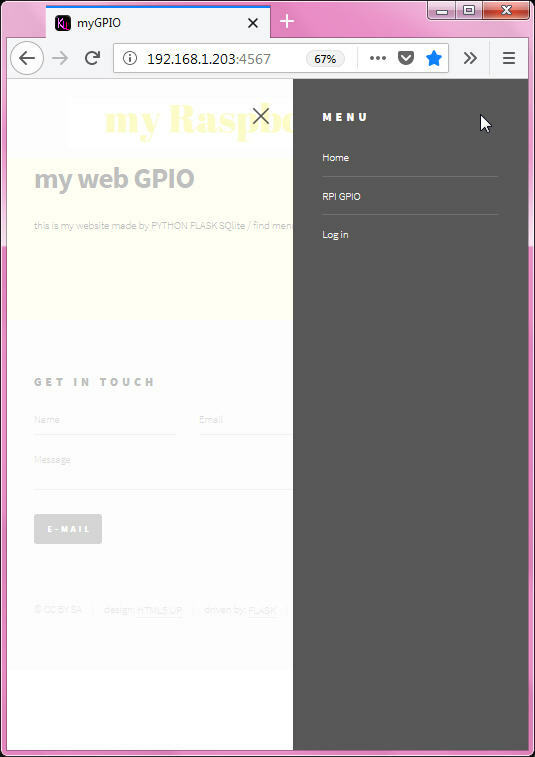 i extract the MENU to a external menu.html. similar to the records used here in / between FLASK and HTML. 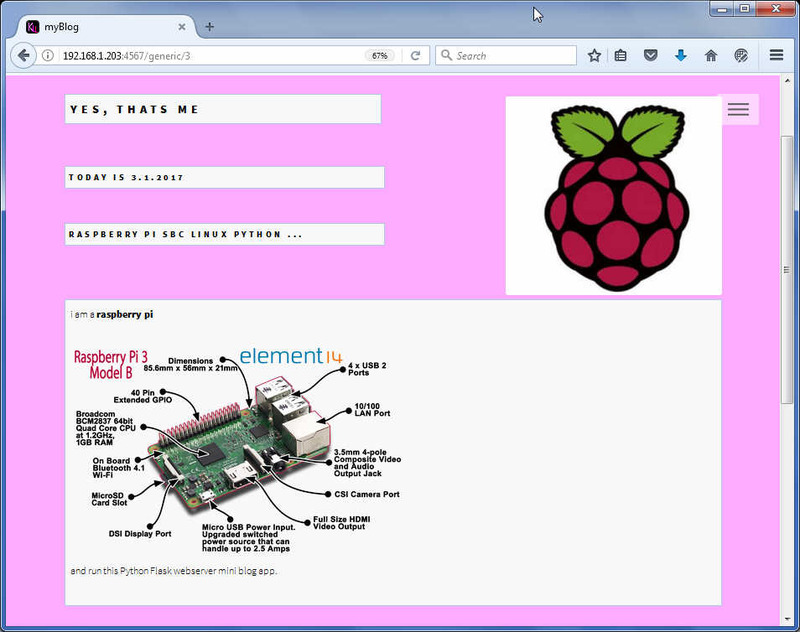 so, i will have fun to make again a PID FACEPLATE but in HTML CSS jquery? animated SVG? a whole new world to learn, good i know what has to be done,even not how? the PID face plate is the biggest challenge, still need a Indicator and DCD faceplate. 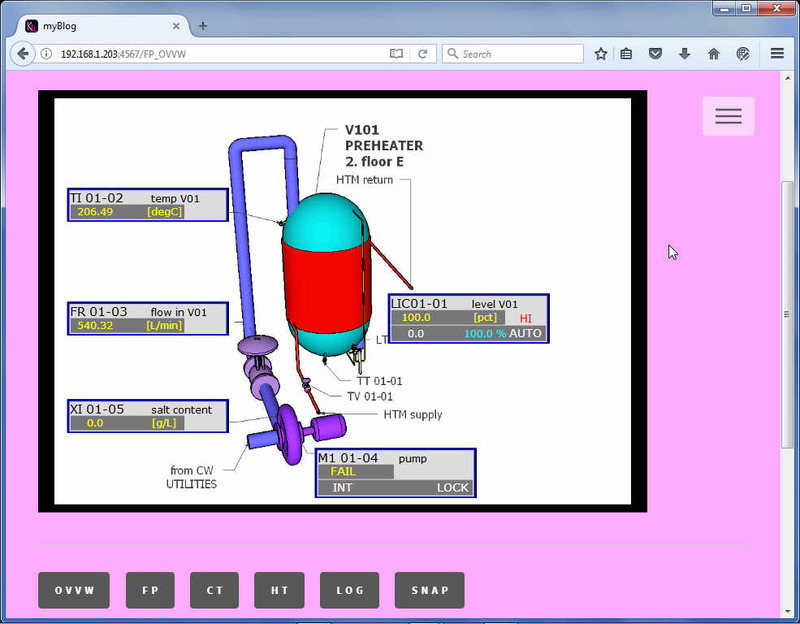 a "operator" page needs a background, could be a real plant / equipment photo, a 3D drawing with vessel and pipes, or a schematic pipe and Instrument diagram. there are to be dynamic elements like ON/OFF valves and motors ( blue stop / green run / red fail ) and level bar graphs for vessel..
better just a link to open one of that OPERATION faceplates for that clicked point. 30 years ago there was just the beginning of the operator displays... usually just face plate groups of all points in one page. But you see, the number of different dynamic elements is not that big, even in PCS Configuration systems with blown up SCADA design tools, you just do PID / IND / DCD faceplate, a Valve / Motor / level Dynamical templates and a static background what could be a picture ( for my uPCS in RPI i used a screen shot of a 3D vessel / pump / pipe / instrument while i made it using Google SketchUp. TAG NAME, TAG DESCription, Engineering Units, and PV and SP are to be scaled between LOW and HIGH range. depends on point config options. -[SEND] the original execution button to send changes to Arduino. but i have some problems to apply CSS? 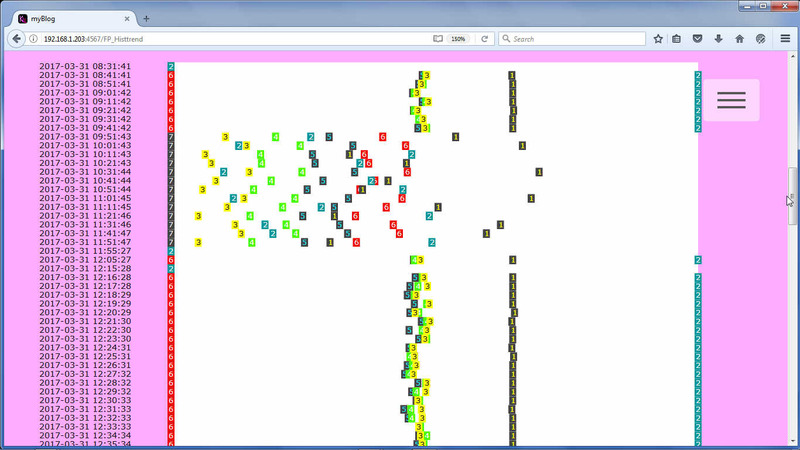 so the result is a HTML5 NoNo. actually i hate that relative object packing, i want something like a box ( where i can say where it shows up ) and a absolute pixel position of graphical objects inside that box. as the principle works i can go to the details. Here info about SVG Animation. 83 S 86 V 71 G 32 space 105 i 115 s 32 space 99 c 111 o 111 o 108 l 33 ! 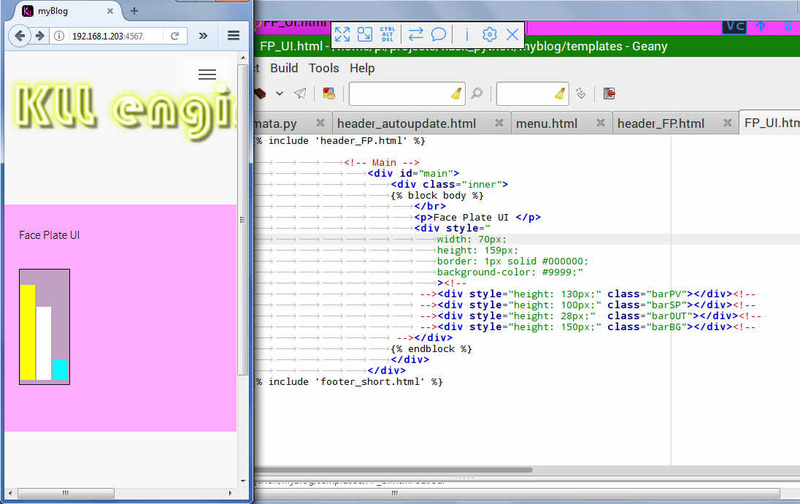 that was my own SVG made WEB FONT build into this PHP Fusion CMS ( with edit BBCode using a PHP insert trick ). 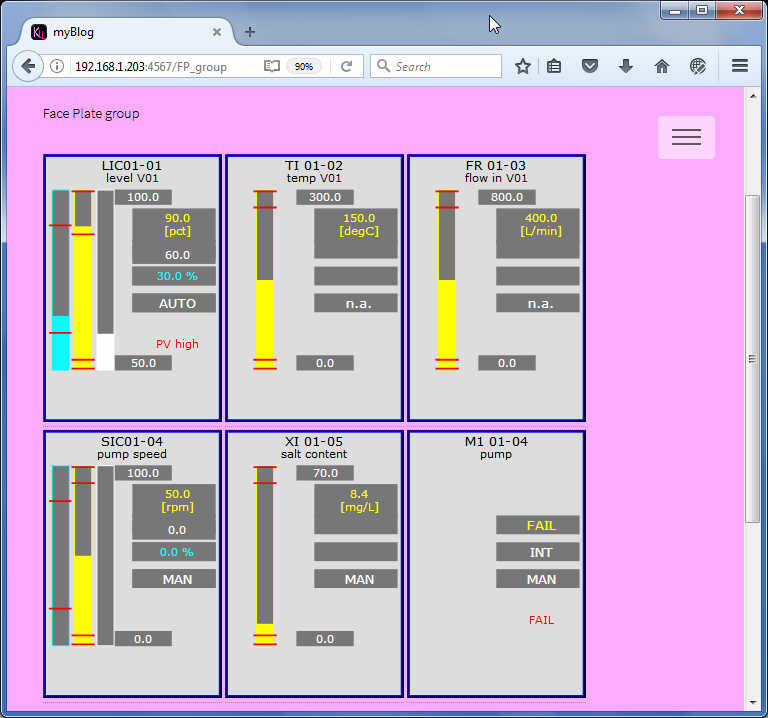 and HTML shows 2 times the SAME face plate, using the different data. when i load it in a index.html file in my PC the style thing not work?? but some blind sliding is ok, a CSS issue. 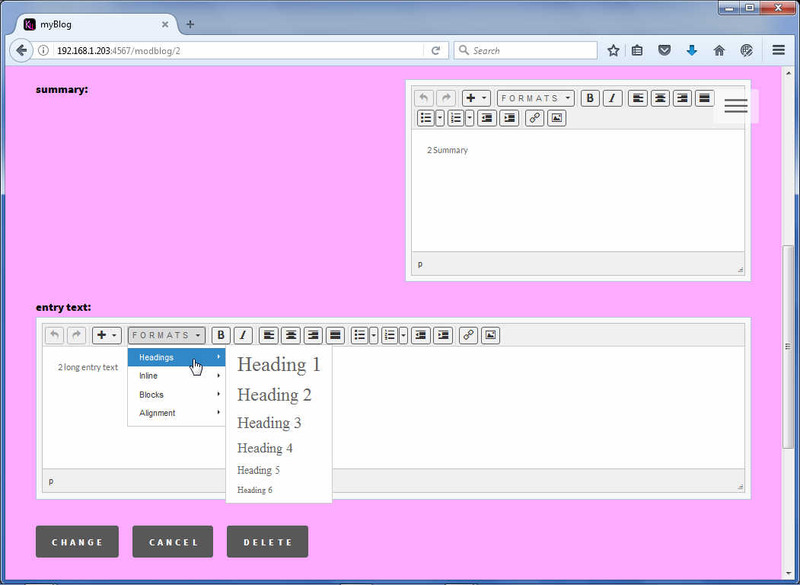 So, the good way is to download that JQuery-UI project after selecting ( like slider ) what you need from here. but i already develop parts of the application. -1- make a array ( of 6 TAGs ) with the static of the point config like names, descriptions, engineering units, all you need at the visualization level and you not have/need on the controller level. 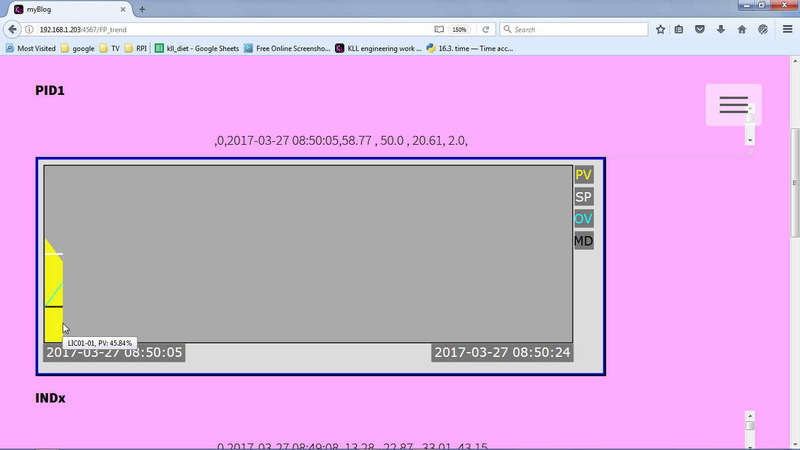 RPI have to show "LIC01-01" " level V01" "pct" low and high range..
but also some other things like the RANGED PV / SP i do outside the SVG and hand it by add columns. now -2- is only for the test here but there should later come real data from the Arduino! if read or set variables store it in that file too. 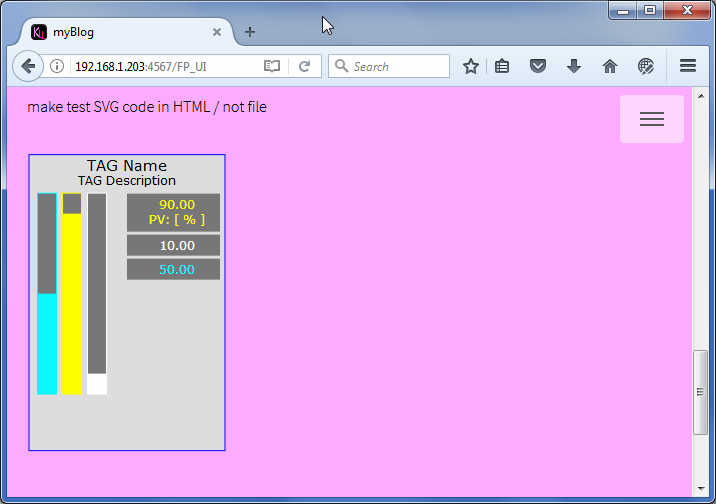 so this file is the memory between the HTML page calls. AND it could be SPAWNed at the moment the file is made. if file exist read , else init array and write to file. 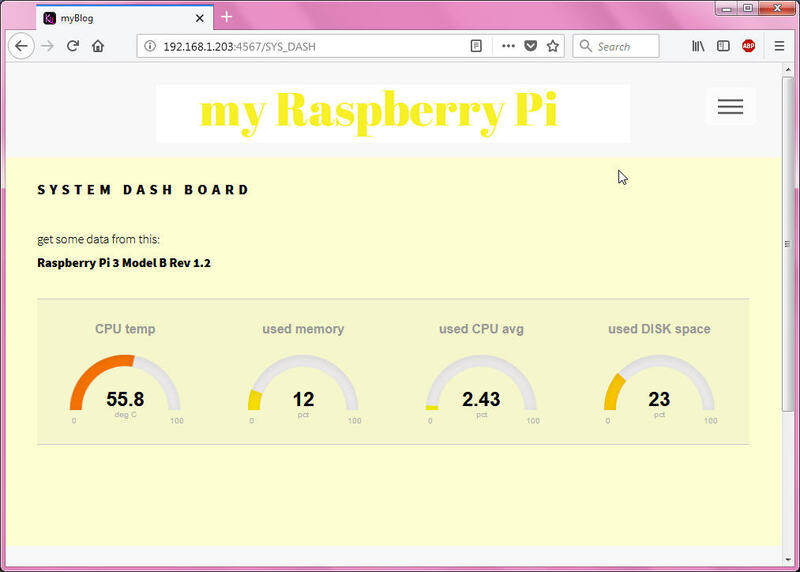 pls understand, if the arduino is ready connected and the RPI is to be used as "uPCS2" then the server should start at boot ( for datalogging.. even the visualization/operation is not used. 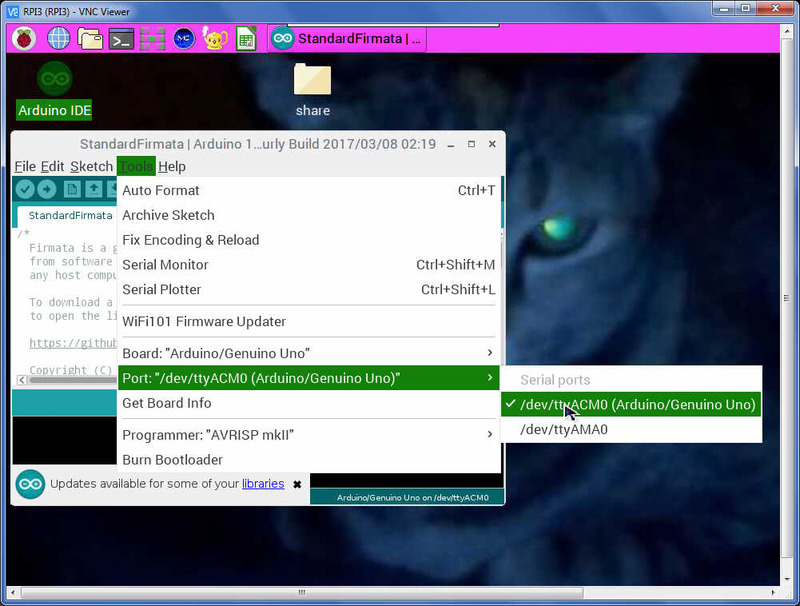 using a different idea for include combined with a switch i load ( as data ) with the template. 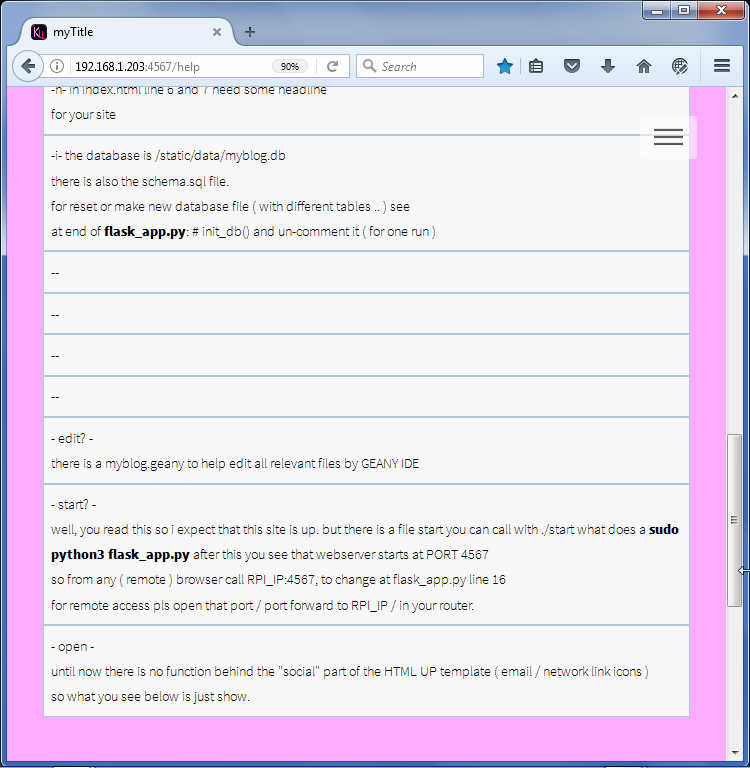 that is a big clean up regarding header and footer files. 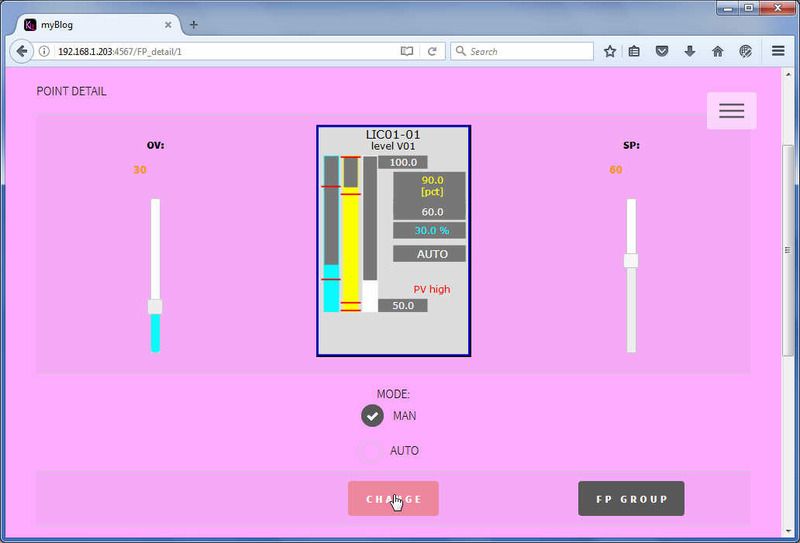 while some FP_x files still in work and carry full header and footer until JS + JQuiry ... is tested. 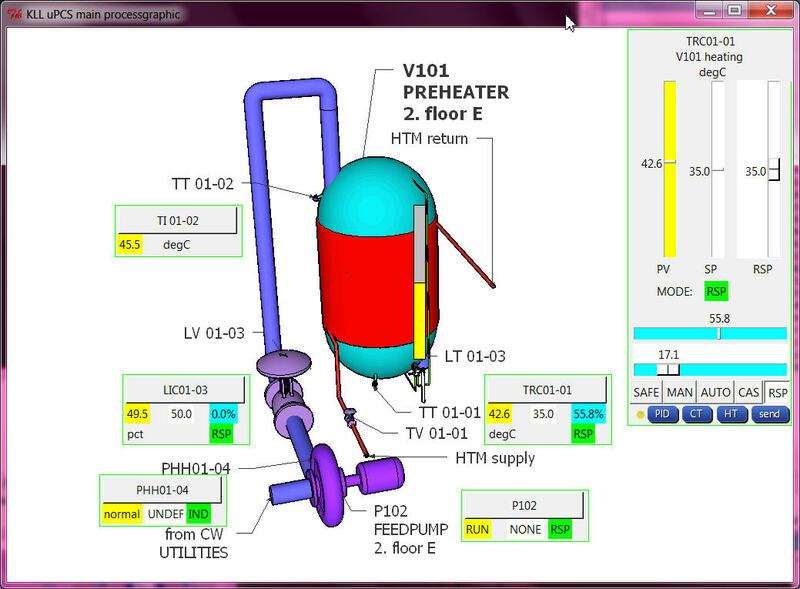 And as dynamic elements inside a process overview picture. There i use SVG inside SVG ( what makes it possible to position when i add a cx cy column to the TAG_list. Sadly the link anchor does not work inside SVG. for the USB interface and storing data to ram disk. so it does not matter which one starts first after boot, the ram disk file will be created. 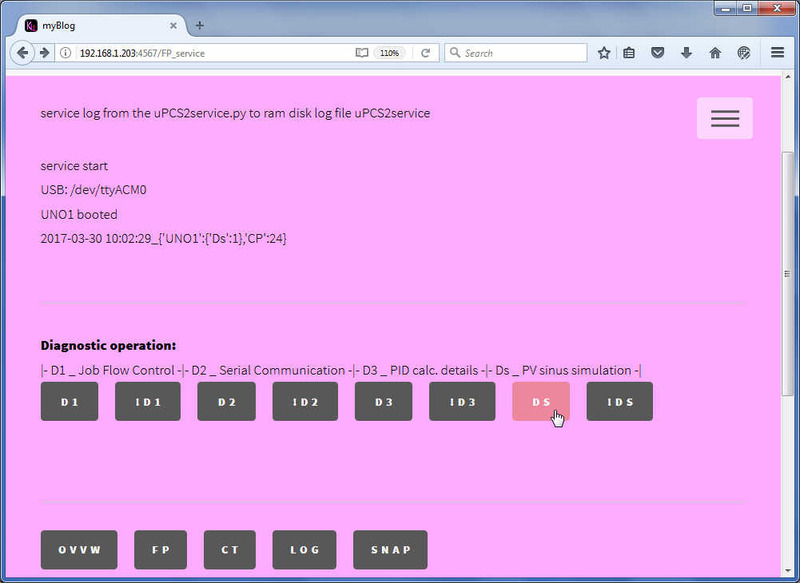 if the communication with the Arduino UNO running uPCS2web sketch can be established it can call for data. here, i also load but not install just to have some python serial code to copy from. a ram disk file /run/shm/uPCS2service is created for log. what can show that progress / or errors online. - for ser read write a byte array thinking and conversion to string requires encode and decode. 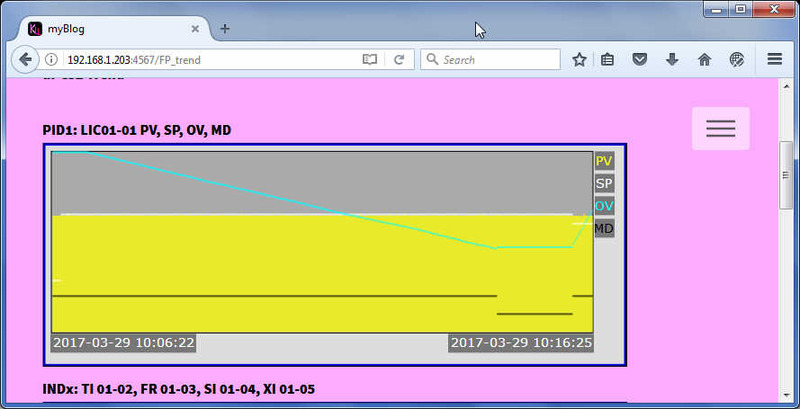 so end of day i just get the arduino sending and i see the measuring lines ( from above pv simulated protocol test sketch ). 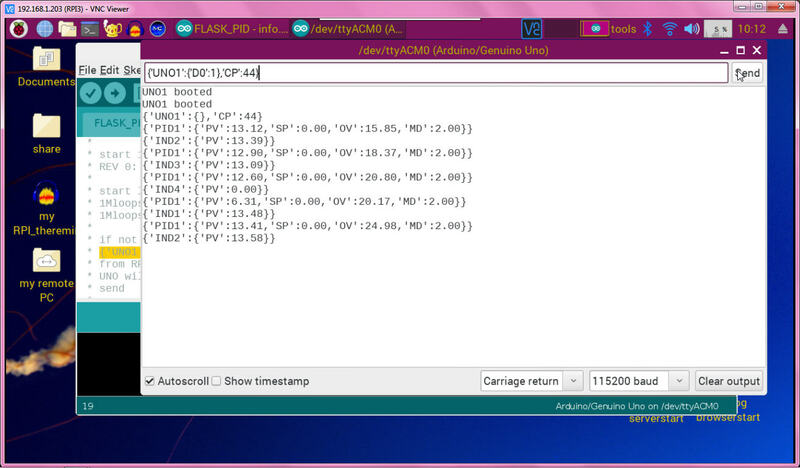 now taking these lines apart and compare with the DBI list and write to ram disk file is heavy coding. while change value and save is the easy part. only with a update rate of HTML display 10sec, but still faceplate show this changing / simulated sinus / values! what else to do if incoming data? its more easy to the data reduction later, but looks like it would require installation. and at the DBI_list check ( time - UNO1. 'TS' > 6sec ) Alarm "TIME OUT"
means ( ringbuffer pointer logic ) to make temporary JSON record list and that dumped to ram disk file. that i have to bring into a GRAPH! no operation needed as that is max resolution and max data. 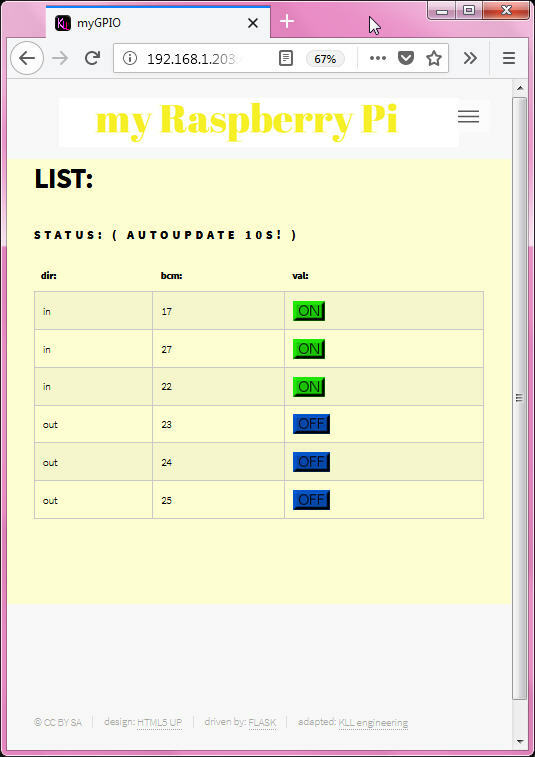 as i have web server and UNO service running i see no load on the RPI3, but i do get error in trend display "pickle load: run out of input " / need to refresh screen. python has no internal multi user file management? the uPCS2service reads it, applies a CP counter and sends to serial Arduino. 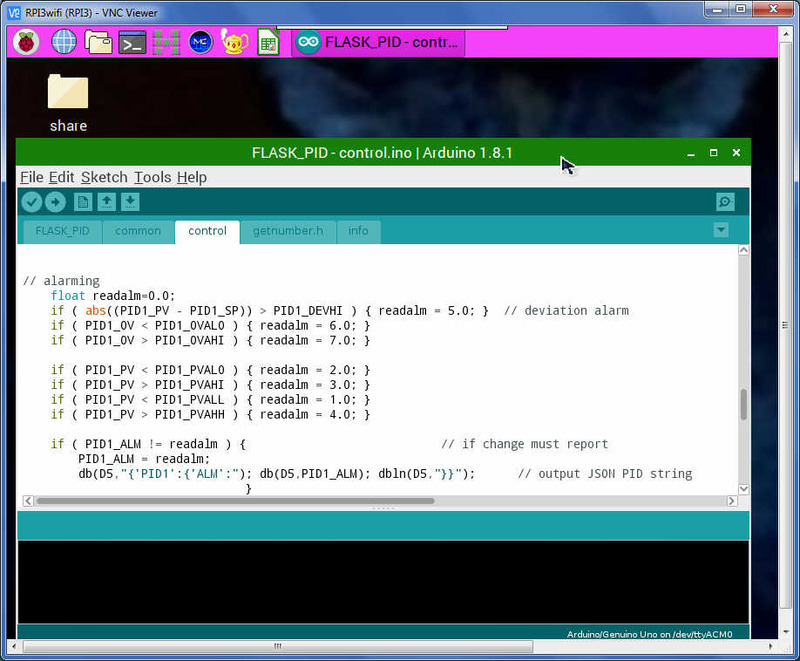 run in AUTO and MAN, change SP all while the PV is "locked" to the 3V3 pin of arduino board. 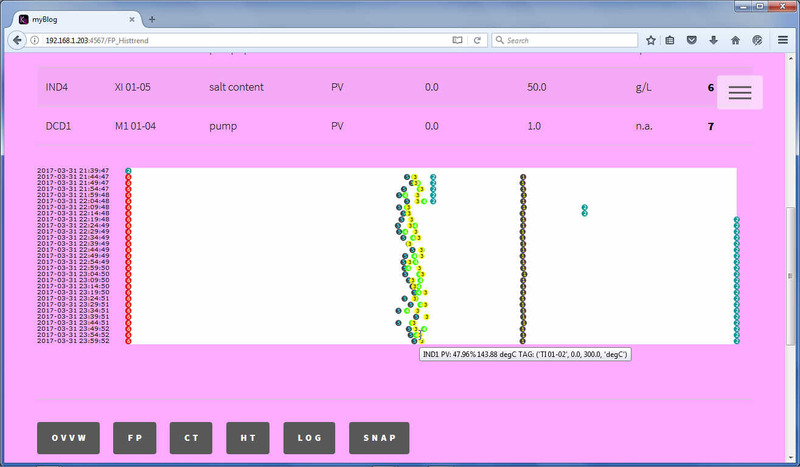 so difficult to understand reaction, but PID is running, need to check more details, esp. 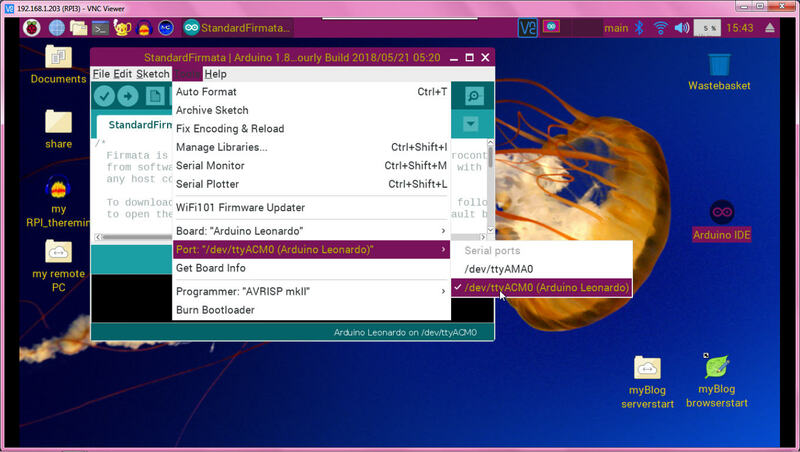 the feature tuning of Anti Reset Windup..
anyhow current project status is tuning only by Arduino IDE and upload. ( it sees the ram drive is empty ) and the uPCS2service is started. after 7 sec wait and 5 sec init data update the data reporting is enabled. 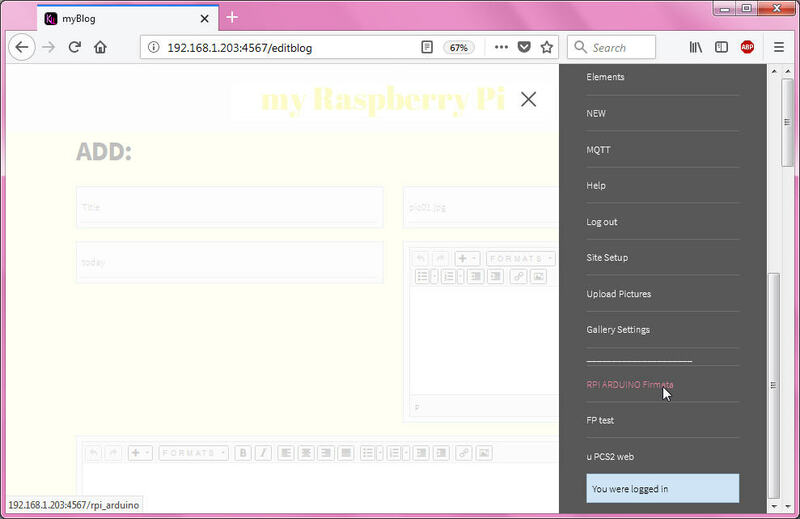 then have 2 open terminals with LOG of HTML server and LOG of UNO service. 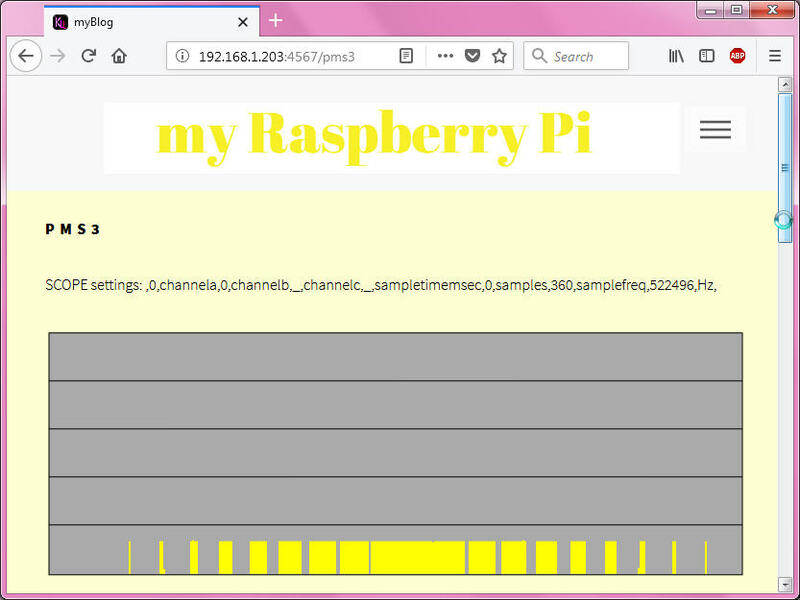 not much load on RPI3. 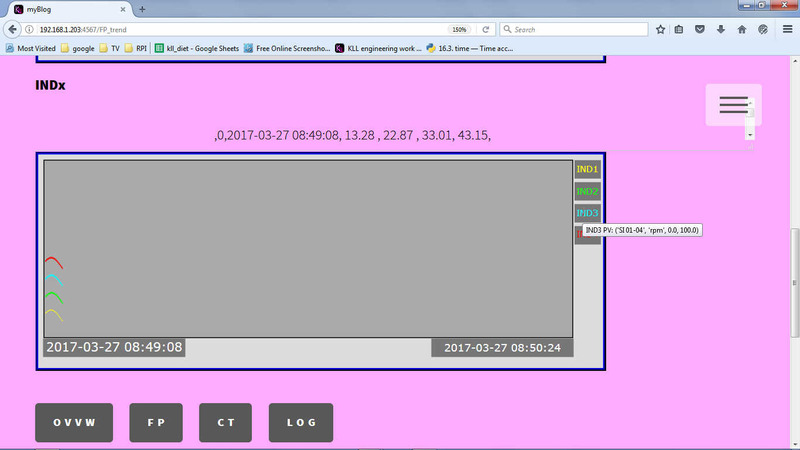 i made a button bar in [LOG] ( service log ) for operation. pls find: FLASK_PID sketch in the next ZIP. so at HT sampling no add calculation needed. the IND values might change or not, YOU learn nothing! like: need higher voltage at lower salt content !!! what to do with that record? -a- to a USB stick ? if at boot / start USB stick and file there is not found? so even your stick has that NAME that file must exist already to be used as storage. 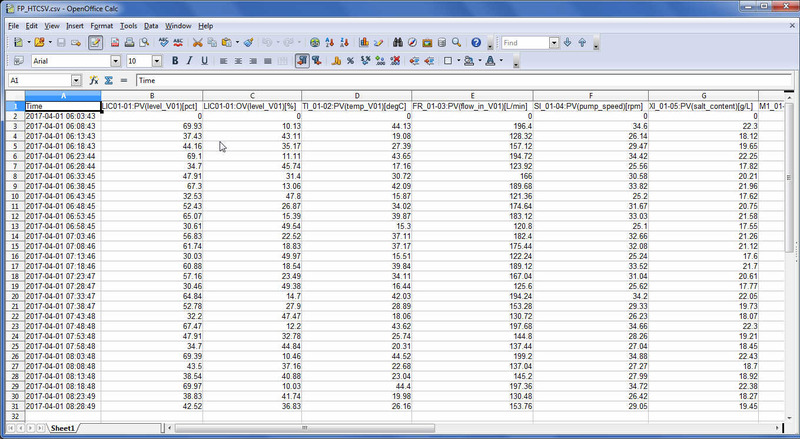 while the code works alread, there is no header line in that file, essential for a good CSV, done. 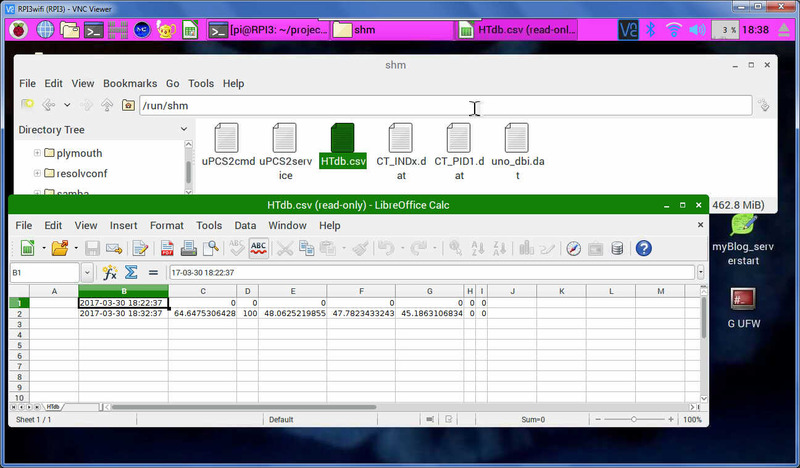 so, in /tools/HTdb.csv is a template file, you can copy to stick and all should work this way too. You see, there is a starting 0.0 value line at service start, so every boot or restart is documented even graphs will look ugly. starting with a list of TAG data. while for the Current Trend i know the buffer length and a trend bar graph style was easy, the Historic Trend has unlimited length / and good that a HTML page not run out of paper, i want give the LINE CHART a revival with combining it with the detail quality of SVG. 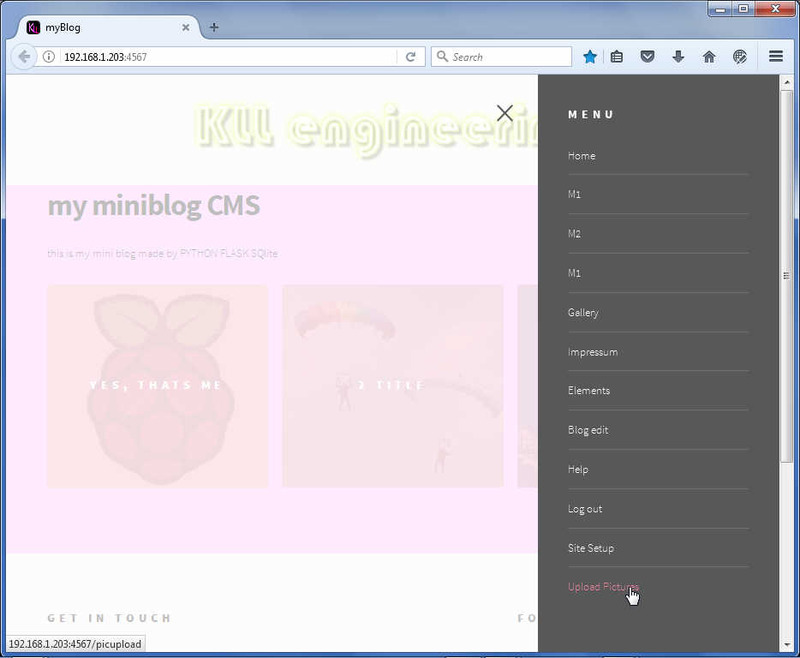 and a width of 1000px so its 10bit resolution! or just download the CSV to the user for local evaluation / storage. 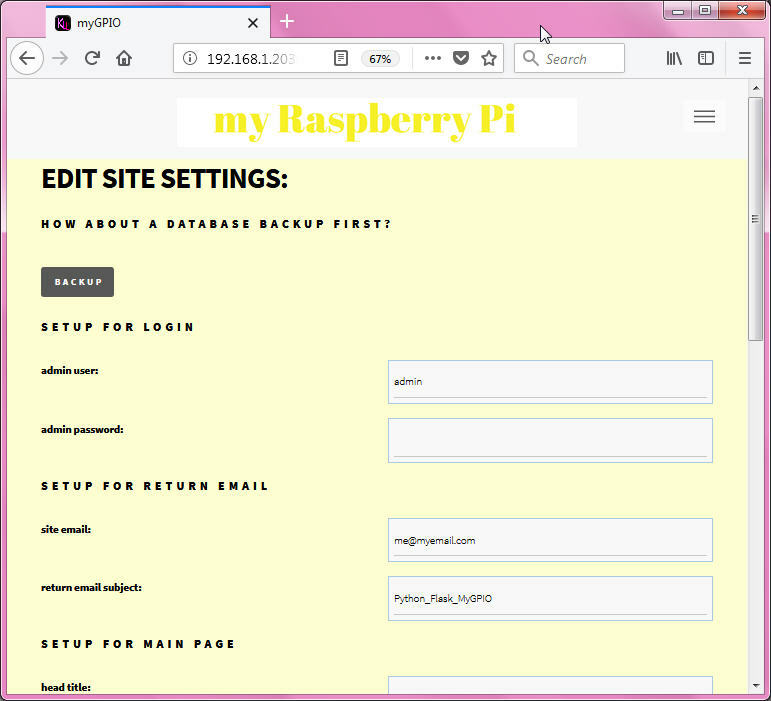 what i actually don't know how to do, as the ram disk is not reachable from HTML, just a link to the file did not work, so need a other HTML page with pure CSV data. anyhow pls note that the data are all in 0. .. 100. 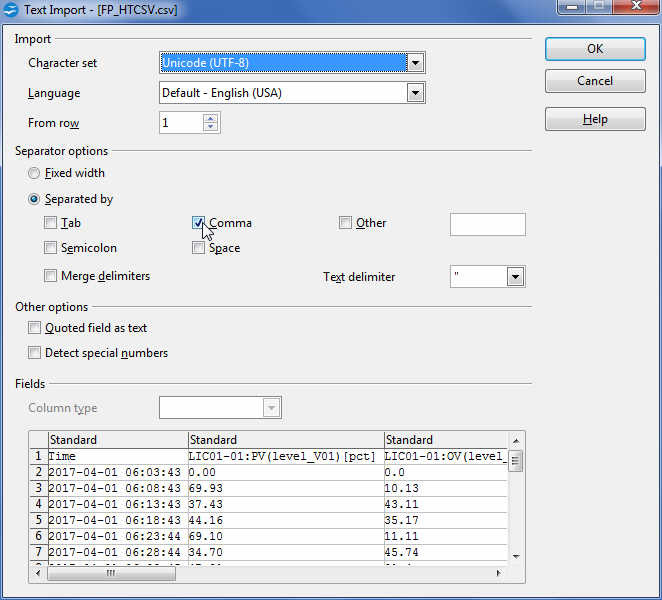 %, for the CSV report the Range conversion is done. 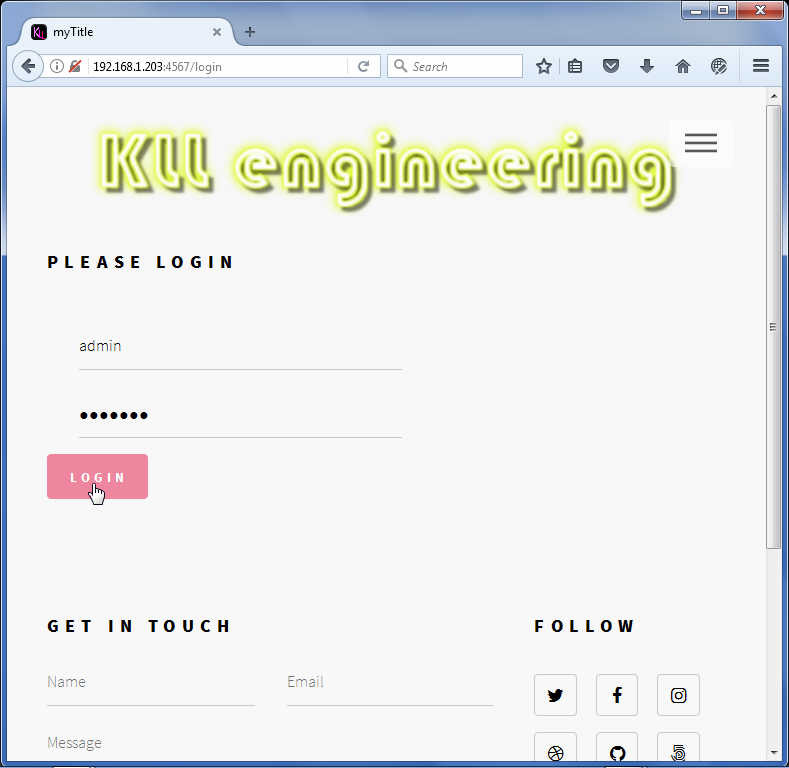 use browser tools like ?FILE/SAVE AS/ FP_HTCSVxxx.csv and import to excel calc ..
also alarm handling like alarm enable disable ( password protected ) alarm acknowledge with logging (user) and keeping a alarm stack... for handling several alarms on one attribute (PV) and their status. here i only want use the first two steps. 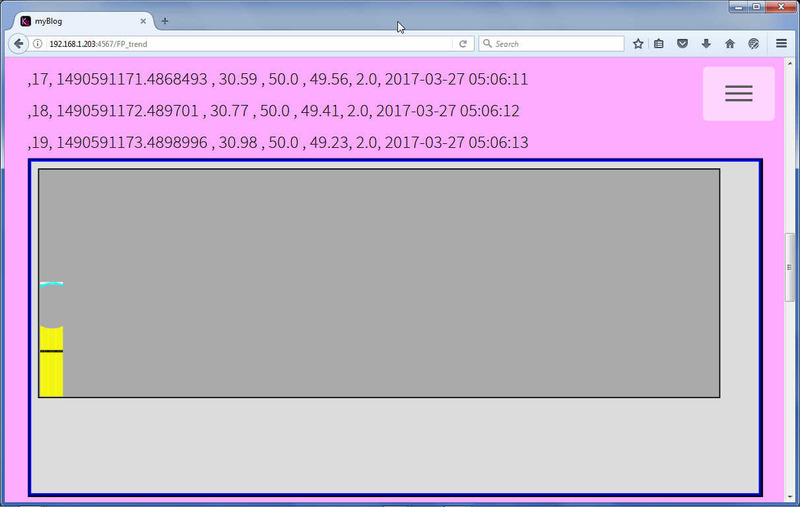 Arduino checks ( at new PV ) according alarm limits. 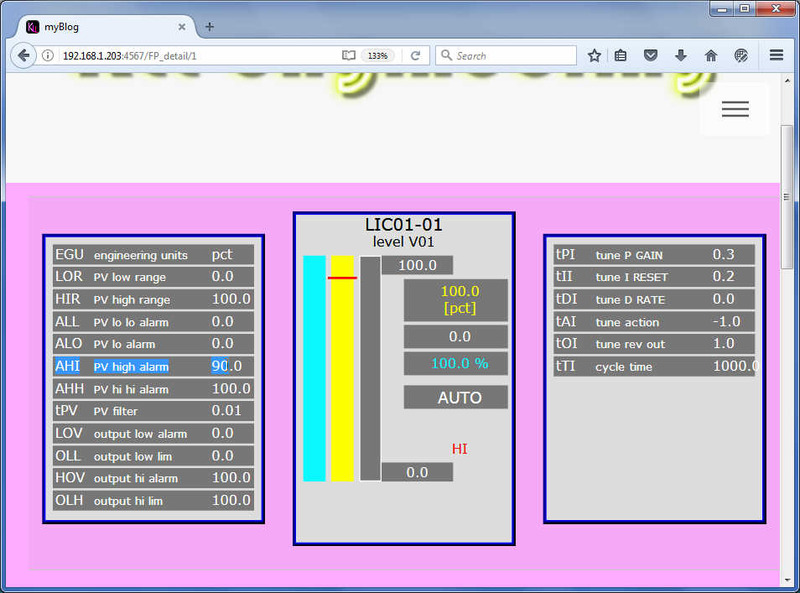 and visualization translate to ALARM WORDs ( on point type ) and show in faceplate. or whatever you name it. while PID and IND are analog input types a DCD is like a PID for digital I/O. it can be only one digital input ( to make a alarm ) or a 16bit word in and out from a fieldbus device like a motor/inverter. the DCD point is just the envelope for the communication CONTROL <--> OPERATION. inside control ( Arduino ) a DCD is actually a PLC of its own. or a logic framework we are free to design now. we select a list of digital inputs and outputs, read inputs in a background job ( PLC style much more often as the 1sec / 5sec analog points job control ) and check on change of inputs, only then start the logical point what will report changes of point status. so instead of making several digital points like one MOTOR and a LevelSwitch LOLO (alarminput) and a startup valve relay output we can do all inside one DCD (reporting) point. 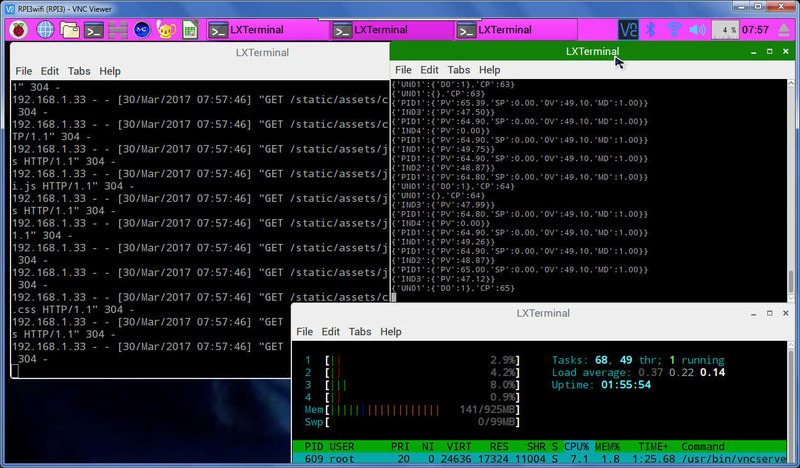 - one python background service handles the USB and read ( command ) write ( data ) to RAM DISK FILES. 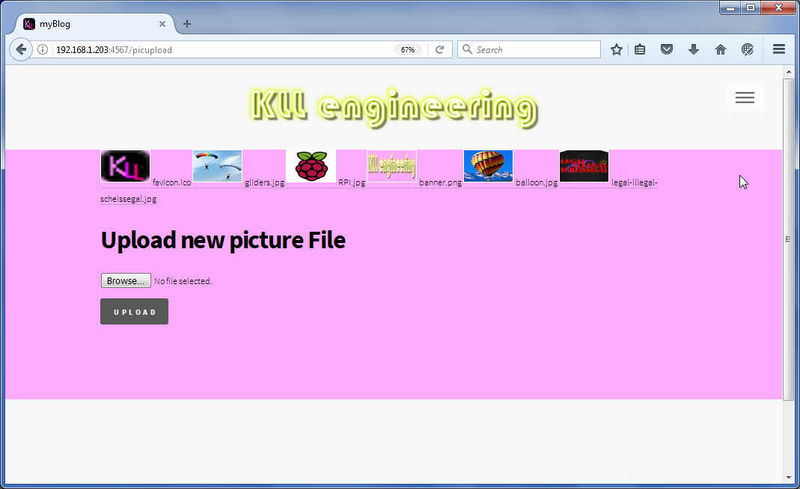 - while the new web server reads the data and writes the command files there. i was told SOCKET IO ( using node.js ) could solve that problem. so i take a side step to here. 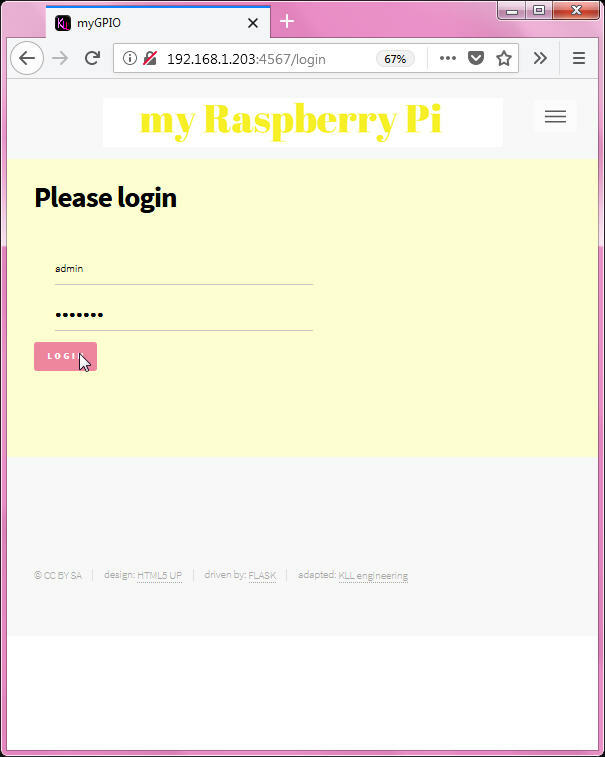 and allow ( if login admin ) operation Dout of ESP via MQTT publish. 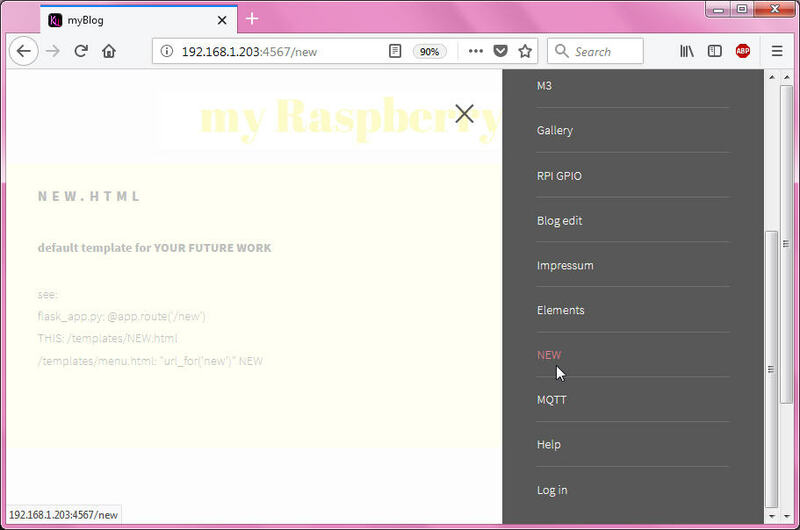 from the ESP MQTT device to a sqlite3 database. and stored at that database too. but once the data keeps flowing operation is fine. and started to learn about SVG path d= and ARC and LINE..
need the pix pos of ARC end at inner and outer radius. and to do all that calcs in python i ended up with a complete programmable tool. 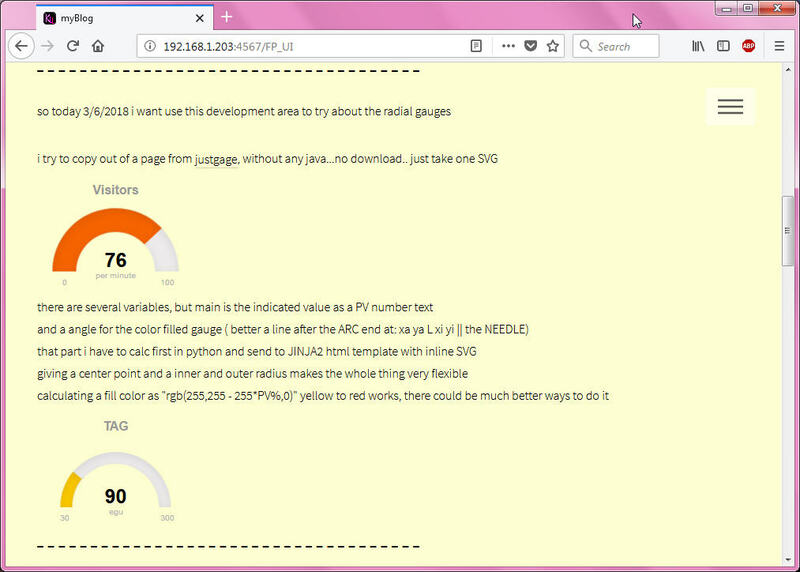 and putting that SVG into a extra HTML file i was able to reuse it for a new page and in there use it by a array of GAUGE settings. but possibly other things not fully tested. all in one is of limited use for someone else..
+ but it is more easy to delete some functionality as to write it again! 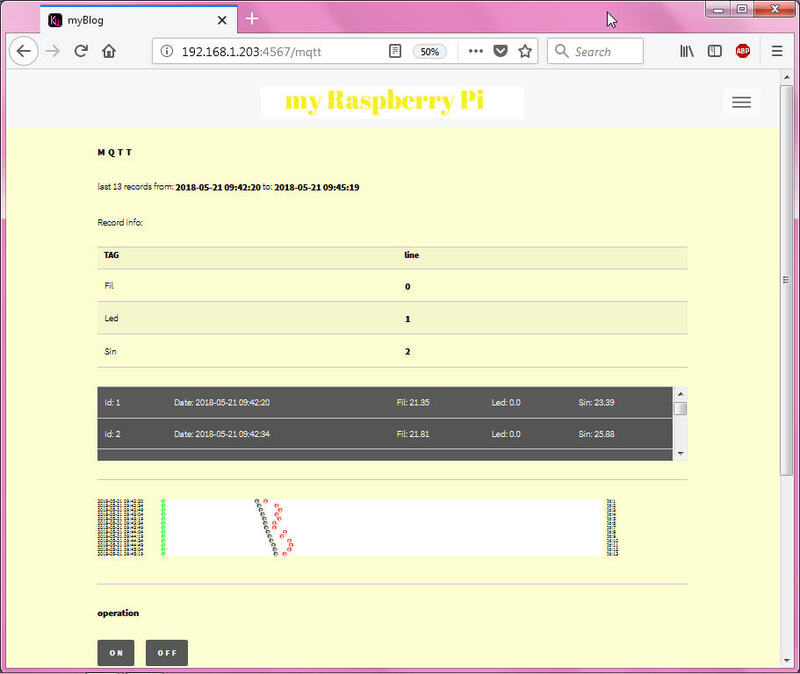 + + and as you see the myGPIO version, i just copy out of myBLOG.